Currently on display in the Jerwood Library are highlights from the large collection relating to the renowned viola virtuoso Lionel Tertis (1876-1975), collected by his biographer John White, and now held in the library archives. 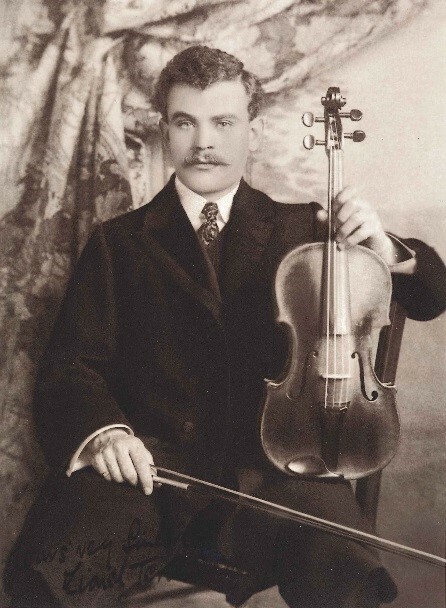 Throughout his long career Lionel Tertis worked tirelessly towards raising the status of the viola to a solo recital instrument on a par with the violin and cello. To this end he inspired and performed many new works for the instrument, was a prolific arranger of works originally written for other instruments and even produced his own design for the Tertis-model viola, in pursuit of a stronger, more sonorous tone. The Tertis-White collection comprises Tertis’ manuscript arrangements and annotated copies of music he owned, along with photographs, correspondence, concert programmes and other memorabilia. It was the life’s work of the much-respected violist John White whose definitive biography of Tertis was published in 2006: Lionel Tertis: The First Great Virtuoso of the Viola. Trinity Laban’s Faculty of Music (then Trinity College of Music) played a formative role in the development of Lionel Tertis’ career. He studied piano, harmony and violin at the college on an ad hoc basis between 1892 and 1894. On leaving the school Bradbury Turner, principal at the time, wrote to congratulate Tertis with the words ‘Remember, study is unending’. Much later, at a dinner given in his honour in 1962, Tertis spoke of the ‘benefit and musical enthusiasm’ he had received during his studentship at TCM. In 1966 the college awarded him an Honorary Fellowship and, after his death in 1975 his widow Lillian Tertis donated an important collection of Tertis’ scores to the college library, including many of his manuscript arrangements. Now, with the accession of John White’s archive – generously donated by his widow Carol –Trinity Laban holds the largest collection of Lionel Tertis material publically available anywhere. Lionel Tertis also has a living connection with Trinity Laban through the professors of viola Roger Chase and Rivka Golani. It was Rivka who made the premiere recording of Tertis’ arrangement of Elgar’s Cello Concerto, the CD of which can be found in the Jerwood library here. And it is Roger Chase who can be seen in the photo above playing Tertis’ 1717 Montagnana viola. Moreover, Roger’s teacher Bernard Shore, Tertis’ student and friend, would occasionally take him to Tertis’ house for lessons with Tertis himself. This 17 1/8” viola is the instrument that Tertis used at the height of his career and helped provide the inspiration for his later development of the Tertis-model viola, seeking to find something of the deep sonority of the Montagnana but in a form more manageable for smaller hands. When Tertis began his career he had to work hard in order to overcome public prejudice against the viola as a solo instrument. In his autobiography, Tertis mentions overhearing someone remarking to their neighbour at one of his first solo concerts: ‘I believe a viola is a peculiarly-shaped brass instrument’, such was the lowly status of the instrument at the time. He goes on to implore the ever-increasing number of violinists choosing to take up the viola: ‘strive to enlarge the library of solo viola music, by fair means or foul. Cajole your composer friends to write for it, raid the repertory of the violin, cello or any other instrument, and arrange and transcribe works from their literature suitable for your viola’ – advice that Tertis himself followed throughout his life with the single-minded dedication that was reportedly so characteristic of him. Representing this dedication to enlarging the viola repertoire with arrangements, on display in the exhibition is the original manuscript in Tertis’ hand of his arrangement of Delius’ Violin Sonata no. 2, pictured below. Tertis was a prolific letter writer and on display are a selection of some of the more well-known correspondents from the large collection of letters in the archive. There’s a letter from Edward Elgar discussing and expressing his approval for the viola arrangement Tertis had made of the composer’s much-loved Cello Concerto; a letter from William Walton expressing his thoughts on Tertis’ retirement; an invitation to dinner from British Prime Minister Edward Heath; a note from Ralph Vaughan-Williams apologising for being too old and deaf to conduct a piece for Tertis; a letter from famous pedagogue Nadia Boulanger and a note from Fritz Kreisler, warmly expressing his friendship. One work of which I did not give the first performance was Walton’s masterly concerto. With shame and contrition I admit that when the composer offered me the first performance I declined it. I was unwell at the time; but what is also true is that I had not learnt to appreciate Walton’s style. The innovations in his musical language, which now seem so logical and so truly in the main-stream of music, then struck me as far-fetched. It took me time to realise what a tower of strength in the literature of the viola is this concerto. Many other British composers also wrote pieces especially for Tertis, among them John McEwen, Arnold Bax, Benjamin Dale, York Bowen, Frank Bridge and Harry Farjeon, Vaughan Williams and Arthur Bliss, all of which are represented in the archive. Tertis also spent much of his life thinking about the ideal shape and size of the viola. If it were built in proportion to the violin or cello it would be too large to play under the chin, yet this smaller size means a compromise in sonority. Tertis’ tone was big, beautiful and powerful and he insisted on playing an especially large viola to help achieve this. In particular it helped produce his desired rich and resonant C-string sound, bordering on the quality of a cello. He had no time for small, nasal sounds from small violas. Seeking to solve this problem for the viola in general, Tertis began a collaboration with the violin and viola maker Arthur Richardson, aiming to develop an instrument large enough to produce a strong, sonorous tone, yet not so unwieldy that it was too difficult to handle. He entered this quest for the perfect size and sound with the kind of single-minded enthusiasm that characterised much of his life, sending plans to makers all over the world and leading to the production of hundreds of instruments built to the specifications he originally developed with Richardson. On display in the exhibition are a selection of plans, diagrams, photographs and correspondence all relating to his famous Tertis-Model Viola. Although some violas made to the Tertis pattern are still in professional use, in many ways the Tertis-Model has been relegated to an interesting historical development. Many of today’s players get a great sound from violas of various shapes and sizes, giving the player a degree of choice unthinkable in Tertis’ time. Nevertheless, the effort Tertis put into his model has created a huge amount of interest in the whole question of viola size and shape, and has led to the opening up of many new paths of development for the instrument. It is just one of the many ways that Lionel Tertis has left a deep and lasting legacy in the history and development of the modern viola. This entry was posted in Archives and Special Collections, Exhibitions and tagged archives, Exhibitions, Lionel Tertis, special collections by jamesluff. Bookmark the permalink. Thank you for this information about the Tertis Exhibit and repository of the John White memorabilia on this master of the viola.